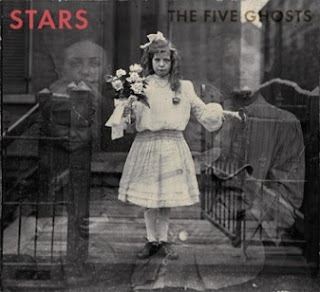 Stars have aptly named The Five Ghosts. The opening track is as haunting in its whispering lyrics and calm guitar line as any track can be. And all that quiet builds into a fuzzy wall that feels submarine, lost and pale, but full. Just starting out, Stars have established the darkness they have so carefully crafted in previous songs about relationships and have here applied it to something bigger, death, itself. Torquil Campbell and Amy Millan have long traded on sadness, break ups and emotional complication, and excelled in surrounding it with both mood-dampened and mood-lifting music. In this newest, synth-y-er release, one that my friend Jared called, "hella Breakfast Club" for it's '80s styling, Stars keep that old ball rolling, and make a handful of phenomenal songs. The Torq-heavy "I Died So I Could Haunt You" touches successfully on some heartfelt sentiments and questions about the nature of life and death. The very idea, that death could bring not all only the infinite love of the departed, but also allow a stalker a sort of all-access pass to one's world is intriguing. The song doesn't necessarily veer into a land of question marks, but Stars doesn't need to. The band latches so strongly onto love and loss that any familiar listener can simply enjoy the music, and new listeners may well find a sentiment they've never heard in music so eloquently before. There are some up-tracks too. The Millan led "Fixed" is a priceless piece of '80s dance pop, heavy on keyboard and synth and drums that exist for drive rather than for show. And the Depeche Mode-esque "We Don't Want Your Body," which lives in thundering electronic drum beats, tortured harpsichord, and Torq's grainy, breathless vocals. What happens in both of the examples above are great pop songs that anchor the album, after all the opening sadness and dread, to something that could very well be, at least musically, positive. Then comes a funereal track in the form of "He Dreams He's Awake." The song is as heavy as any of the band's previous dark material, but additionally lacks the analog feeling of warmth inherent to real instruments. All the echo and synth and drum machine makes the track feel lifeless, beyond even the darkness of the lyrics or minor-nature of the key. A minor "comeback" in terms of pace, "The Passenger" is like a Blondie song on sleeping pills, but sells itself on Millan's excellent voice during the chorus breaks. And its songs like these last two, and those that cap the album that make The Five Ghosts a little work to love. As a previous fan of Stars' work, I know what they've done and where they've been musically. And in a way they can do no wrong in my eyes (or ears, as the case may be). But, for a casual listener, or a new participant in this band, The Five Ghosts is at times oppressive and lushly cluttered with robotic sound. On the other end, though, Stars are trying something new, a bit of reinvention, at least in sound, if not in lyrical content, so that is something to be admired. The bottom line, for me, is that this new release is a mood album. It requires a level of positivity going in just to overcome the darkness and sadness draped within. Stars has never been entirely about dance pop, and that a major portion of this foray into the genre is a success is a true accomplishment. I feel like, as albums go, this one is more of a grower. With time, there will be more than 4 tracks to which I latch. And I look forward to the time I spend finding out which songs those will be.